Level Primer White is a new generation of post-catalyzed amino alkyd finishing system that offers the ultimate in durability. L'apprêt niveau blanc est une nouvelle génération de systèmes de finition amino-alkydes post-catalysés qui offre une durabilité ultime. Level™ Primer is to be used with M.L. Campbell® products. Surface Preparation: Strip old finishes completely and remove all contaminants from the surface. Make sure surface is dry. Remove any dirt, grease or other contamination and sand as required. If desired, apply WoodSong II stain as directed by the specific M.L. Campbell Product Information (PI) Sheet, prior to finishing. Reduction: If blushing occurs, use M.L. Campbell’s C162 Flow Enhancer 1, or C161 1 Care Retarder. Mixing: Level Primer White has been developed to start its cross-linking (drying) with the addition of 12.8 ounces of C149 1 Care Catalyst per gallon (10:1 ratio). Always mix in the catalyst thoroughly before application. No waiting period (sweating in time) is necessary before using this product. Once catalyzed use within 12 hours. Application: Level Primer White was designed so that you can build the dry mils past the normal 5 mils maximum recommendation. So, if you want to have a full fill or thick build look and you do not want to go to polyurethane, Level Primer White is for you. For a full fill look, sand back each coat more aggressively. For a thick build look, just sand with a light scuff between coats. 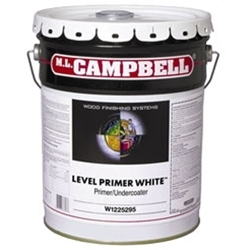 Level Primer White gives you good sag resistance and can be sprayed from 4-10 mils wet on a vertical surface. It can also be built up to 10 mils dry by allowing each coat to dry thoroughly, lightly scuff sanding between coats. THESE PRODUCTS ARE DESIGNED FOR SHOP APPLICATION AND PROFESSIONAL USE ONLY. Use only after all safety information is understood. Refer to the Material Safety Data Sheet (MSDS) for additional information. Leading the way. A leading North American manufacturer for the wood finishing industry, M.L. Campbell has built a reputation of dependability and product excellence for over 100 years. As an exclusive manufacturer of wood coatings, we are dedicated to supplying our customers with high performance finishes. Focusing strictly on wood coatings, we combine the best of North American and European formulating technology to create a full line of advanced finishing products and systems. Breakthrough R&D. We believe that by developing the world’s best wood coating technologies, M.L. Campbell will remain on the cutting edge of the rapidly evolving wood finishing industry. But we don’t stop at offering the best products. We’re also dedicated to finding new ways to safeguard health, safety and the environment, without sacrificing quality or performance. Our R&D lab is dedicated to providing very low VOC breakthrough coating systems that are safe for both shops and the environment. We also offer state-of-the-art formaldehyde and isocyanate free water borne products by using cutting edge resins that bridge the gap between solvent and water borne products. Not only do we understand the importance of compliant coatings, but our lab takes special time in hand crafting the formulas for ease of application with all of the durability that you expect from a wood coatings leader.